Selection of the tree species for sawdust cultivation should proceed with caution. Fresh sawdust without aging by fermentation can be used for production of shiitake only if it is from high quality tree species, such as those graded 4, excellent by FAO (Oei 1996). Oak, chinkapin, hornbean, sweetgum, poplar, alder, ironwood, beech, birch. It is always preferrable not to ferment but age the sawdust for 3-4 weeks. Periodically turn the pile to air and cool the pile. Table 1. Formulation of sawdust-based substrates for shiitake cultivation. Many other formulations are available in articles on the internet. Water should be mixed into the substrate to about 48-50 percent, and not 60% as suggested several years ago. Water should not appear at the bottom of the bag at anytime. Semi automatic filling by a travelling pipe which come to one position to be filled and to a second position to discharge into a bag. Bag folding before autoclaving. After bags are filled below filter, the remaining bag is folded. Automatic form seal machine. See Automatic FFS Machines. Sterilization depends on bag size and, nature and amount of the substrate. For 2-3 kg. Sawdust-based substrate in polypropylene bags, sterilize in autoclave for 2-4 hours at 121°C. (use as a reference only). Initially during trials, it is always necessary to tract the temperature in various parts of the autoclave as well as in the bagged substrate by insertion of a thermocouple inside the substrate. After the substrate reach 121°C, it is necessary to maintain at 121°C for 30 minutes. When cooling, allow HEPA filtered air to replace vapor in the autoclave. After thoroughly mixing the spawned bag, it is placed in a incubation room at about 23°C. Check the characteristics of your shiitake strain, especially fruiting temperature and adjust accordingly. The following is adopted primarily from Stamets (1993) for strain China-Stamets-2, a strain with a broad range of tmeperature for fruiting. This strain can be fruited at either cold temperature* or warm temperature**. See Table 2 for detail in growth parameter management for spawn fun, induction of primordia and fruiting development. Table 2. Growth parameter management for cultivation of Lintinula edodes (shiitake). Humdity 95-100% R.H. 95-100% R.H. 60-80% R.H.
Mycelial growth of normal spawn run: enzymes are produced to degrade components in the complex substrate, such as cellulose, hemicellulose and lignin. Mycelial coat formation: A thick white mycelial coat on the substrate surface is formed 2-4 wks. after inoculation (spawning) in most strains. Very thick coat can be formed at high CO2 level. Mycelial bump formation (blister stage, or popcorn stage): clumps of mycelia are developed in some strains. Primordia are produced at the tips of some of these bumps. However, most bumps are aborted. Fluctuation of temperature and high CO2 concentration encourage bump formation. Over-developed bumps may puncture the bag. Bumps can also be susceptible to contamination by weed molds. Some aeration should be provided whem bumps are formed. Remove bags before pigmentation, or browning (Royse 1997). Timing of bag removal is crucial. Yield can be effected if bag removal is too early or too late. Maintain 60-70-% R.H. to avoid contamination. Pigmentation and coat-hardening stage (browning and bark-formation stage): Browning outside of thebag is encouraged in U.S., in contrast to browning inside of the bag. Some growers remove the bag when 1/2 to 1/3 of the mycelia becomes brown. With exposure to open air, mycelia turns reddish brown at the surface and eventually forms a dark brown protective dry surface which functions like a tree bark. The inner substrate becomes soft and moist as a consequence of fungal metabolic activities. Be aware that moist coat invites contamination. The desirable stage for markets: when the edge of the mushroom cap is still in-rolled downward (60-70% cap opening). Be aware that some fast-growing strains (e.g. China-Stamets-2) may produce unexpected pre-mature fruiting before mycelial maturation (not desirable). Care should be taken to move the blocks as little as possible during spawn run as moving (physical shock) may trigger pre-mature fruiting in such strains. Lower the humidity to 60% R. H. for 6-12 hr. before harvesting. Harvest when the edge of the mushroom cap is still in-rolled, or when the mushroom cap is only partly extended (60-70%) before it is fully open, as the market dictates. Hand pick the mushroom by holding the mushroom stalk and gently twisyting it from the substrate block. Trim the end of the stalk of the harvest when necessary. Cut off residual stalk stubs from the substrate. Dry (Stamets 1993: 30-50% R.H. at 21°C, 7-10 days of dormancy), then soak the substrate block for up to 12 hr. for the second flush, and up to 18 hr. for the third flush (Royse 1997). Adjust accordingly. Larger bags with more substrate produce more flushes. In contrast to growers in southeast asia, heat-sealed larger bags with microfilter breathing windows are used in general by growers in North America for shiitake cultivation. These bags, each filled with 2-3 kg, or more (sometimes 6 kg) substrate, produce more flushes of mushrooms. In methodology, through spawning, browning outside of the bag, and water soaking for fruiting induction are commonly adopted here. 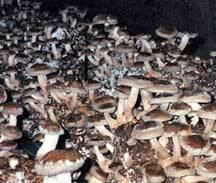 Mushrooms are produced under indoor controlled growth parameters.See 3. Management of growth parameters as an example by Fungi Perfecti. 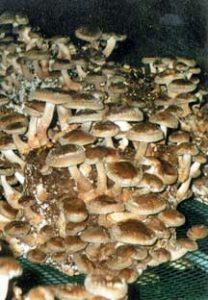 There is a tendency for North American growers to use faster growing strains.Shiitake mushrooms produced by growers here are sold as a fresh produce. 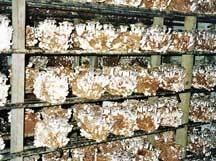 Growers must be aware that experience helps in shiitake cultivation, a process of science and art. The intention of reviewing each stage of shiitake synthetic log cultivation and studying model systems, is to give growers some insights and inspiration to adopt the best possible methodology for their individual needs in growing a very worthy mushroom. Mozuno, T. 1999. The extraction and development of antitumor-active polysaccharides from medicinal mushrooms in Japan (review). International Journal of medicinal mushrooms, 1(1):9-29. Oei, P. 1996. Mushroom cultivation. Leiden, the Netherlands: Tool Publications, pp. 126-137, 93-204. Royse, D. 1997. Cultivation of shiitake on natural and synthetic logs. University Park, Penn State , PA: College of Agricultural Sciences, Cooperative Extension, 10pp. Stamets, P. 1993. Growing gourmet and medicinal mushrooms. Berkeley, CA: Ten Speed Press, pp.259-276. Stamets, P. 1999. Mycomedicinals: an infomational booklet on medicinal mushrooms.Olympia, WA: Mycomedia.